Motley Crue drummer Tommy Lee is featured as part of an anti-animal abuse campaign developed to reduce the incidence of animal abuse in Baltimore, Maryland. The campaign’s theme is “Show Your Soft Side,” and Lee does just that in the latest ad, which sees the drummer alongside his newly-adopted dog, Bowie. Lee is also speaking out on pet adoption, after picking up Bowie at a shelter in Van Nuys. CA. “The [shelter] is scary,” Tommy tells Rolling Stone. 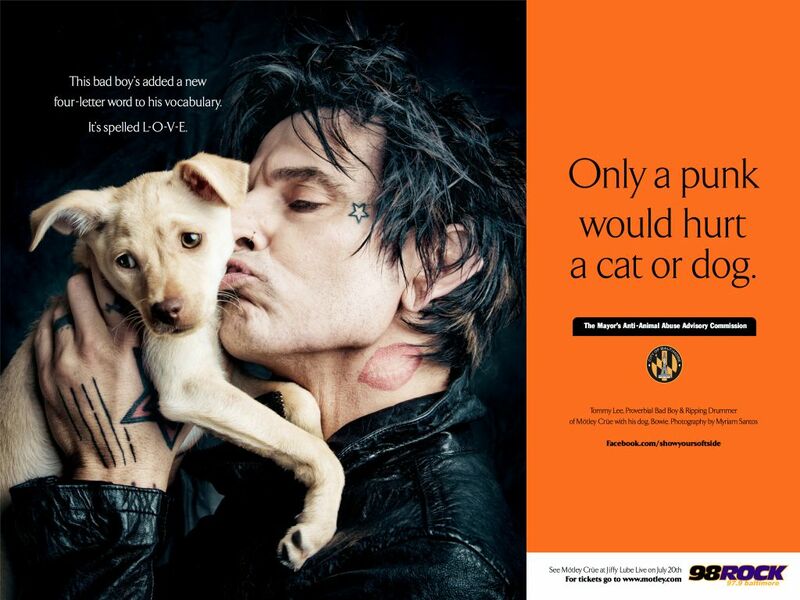 “It is loaded with beautiful dogs and I would highly encourage people not to buy animals from a pet store. They’re bred for all the wrong reasons, for mostly money and it’s just kind of a bad scene. We ended up going [to the shelter] and I’m so glad we did." Lee will be taking his new pal on tour when he and Motley Crue hit the road with KISS this summer. "The road gets pretty lonely, man, sometimes," he says. "It kind of gets repetitive sometimes, so having your little buddy with you is gonna be ripping, man. I can’t wait."